The 2-day December FOMC meeting is underway, and the markets await the announcement Wednesday. Today’s CPI results did not add much in the way of new information. My fearless Fed forecast is that the result will be a policy error. In “FOMC Meeting Something of a Nailbiter”, Tim Duy does a good job of covering the analysis of the logic behind the Fed’s decision. His view is that it could go either way. Since I largely agree with him, I will keep my Fed-watching comments here fairly short. “taper” purchases by $10 billion a month. All three possibilities will likely be viewed in the future as a policy error. Unfortunately, the Fed has backed itself into a corner and all of its options stink. Future generations will look at the chart below, and ask itself, “What was the FOMC thinking?” All I can think of was that this was the FOMC’s attempt to kill the Quantity Theory of Money once and for all. Meanwhile, by delaying yet another meeting, the Fed will appear even further behind the Unemployment Rate curve. And by delaying tapering too long, the Fed may have killed the viability of forward guidance. If the end of bond purchases is too close to the expected liftoff date for Fed Funds, the reasonable expectation will be that the end of Quantitative Easing (QE) is the beginning of the rate hike cycle. The “tiny taper” (by $5 billion per month) seems like the least bad option to me. If speculators have been putting on stupid trading positions as the result of central bank policy, shaking them up every so often seems like good policy. And the illiquidity of the holiday period also means that nothing much is going on. Who cares if rates back up during a period when no one is borrowing? If the markets overreact, the Fed can point out that it will take another 16 reductions of $5 billion to end purchases completely. No investor can afford to admit to their clients that the Fed is dictating their strategy. They all have spiels generally of the form of how they do serious analysis of some sort to come up with their particular picks. They therefore need to craft a description of current conditions that makes them being long make sense given how they profess to invest. Although the sentiment appeals to my cynical world view, I have my doubts about this. Short-term noise in the markets may very well follow news around the Fed. But that only reflects the fact that equity fundamentals are so slow-moving that the short-term market action will blow with the latest fashion. As for the longer-term trends, equities and other risk assets are the only way asset allocators could hit their return targets. 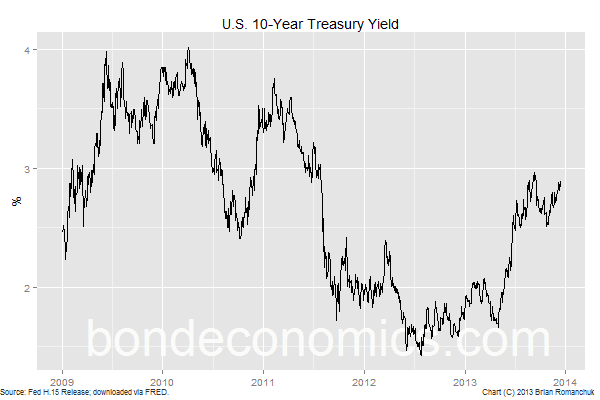 Government bonds at any yield below 4% are not serious contenders for them. As a result, I argue that bond yields now have limited impact on equities; instead equities are following their normal pattern of behaviour since the 1960’s (which is not pretty, as I describe here). 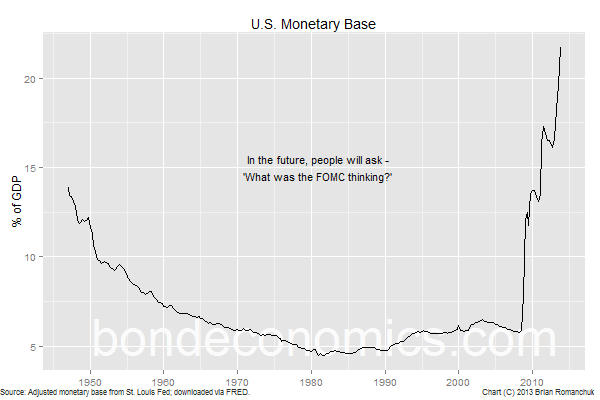 Finally, the “bubbles” does not appear too dangerous for the real economy. As I have seen other commentators note, there has not been an investment boom associated with the current “bubble”. This limits the possible impact of the exuberance of risk asset markets. IPO’s and other financial activities are exciting, but only represent a reshuffling of paper claims amongst the various participants. They only directly add to GDP via the bankers' fees. Financial market shenanigans that do not lead to poor investment or borrowing decisions in the real economy do not have a big enough footprint to overcome the automatic stabilisers.